* Connects your Blu-Ray player, satellite DVR, CD player, Sony Playstation 2 and 3, Xbox 360, ALESIS or other device to your digital audio receiver with this superior quality fiber optical cable. * The soft-flexible PVC jacket protects the delicate fiber core. 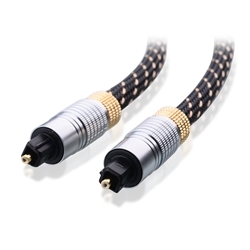 This cable's design eliminates EMI/RFI interference common to standard quality audio cables.